In my novel Pharaoh my Victorian protagonist Major Edward Mayne has a secret purpose for being with the Nile expedition, but he operates in the guise of an intelligence officer whose job is to scout ahead of the river column to spot obstacles and any evidence of enemy activity. 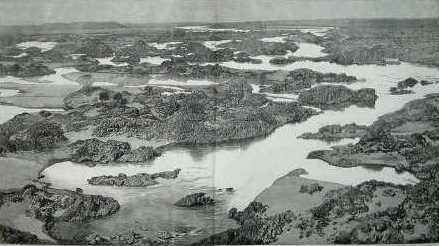 He takes his sketchbook with him to record features of the river, and in his spare time back at camp draws scenes of river activity that he sends anonymously to The Illustrated London News for publication. This is based on reality. Throughout the final months of 1884 and into 1885 The Illustrated London News published many beautiful etchings of the campaign, some of them showing river scenes and credited to ‘an officer of the Nile Expedition.’ It’s a good guess that the man would have been a Royal Engineer like my fictional Major Mayne, highly versed in topographical sketching during his training as a young officer at the School of Military Engineering at Chatham. These illustrations form a unique visual record because there are very few surviving photographs from the campaign. Although photographers had recorded war since the Crimean campaign in 1854-6 – and then famously during the American Civil War – photography was not yet a widely established tool for the military, and in the British army was largely the preserve of the Royal Engineers. The fragility of film in the field and unwieldiness of early cameras meant that the sketchbook still ruled supreme, particularly for covert intelligence-gathering. The slow acceptance of photography reminds me of my naval captain grandfather’s grumble about the advent of automated position-finding at sea, that the only way a navigator could be truly confident of his position was by sextant and chart and all of the old skills of dead-reckoning, and much the same was undoubtedly said among the old guard at Chatham about the importance of the observer’s eye in sketching and getting a feel for the landscape. 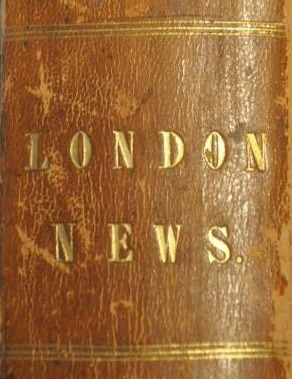 As a boy I was given a bound annual of the Illustrated London News for that year by my maternal grandfather, whose father had himself served in Egypt in the early 1880s with the 6th Dragoon Guards. I pored over those engravings, but never thought they might one day form the basis for a novel! Almost everything I’m passionate about in my novels goes back to a childhood fascination, and as a father myself I’m acutely aware of the need to nurture those fascinations in my daughter, whatever they may be, just as my parents and grandparents did for me. The ‘whaleboats’ of the Nile expedition were its distinctive feature, and in some ways its downfall. In western Canada in his 1870-1 ‘Red River’ campaign against the rebel Louis Riel, General Wolseley had successfully taken his expedition upstream for hundreds of miles using native boatmen to portage and haul their vessels around the rapids of the Winnipeg River. He decided to repeat the plan on the Nile, using hundreds of specially constructed vessels based on the design of Royal Navy ship’s boats, oar-powered but fitted with a centreboard for sailing. Here we see an age-old image of Nile navigation, with boats using the prevailing southerly wind to sail upstream, against the current. 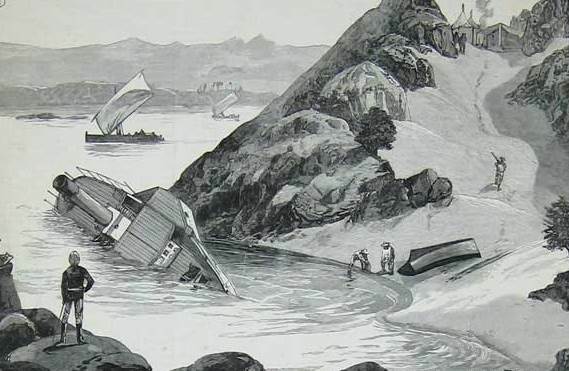 Unfortunately this image did not represent the norm for the expedition and most of the time was spent hauling the boats through the rapids or ‘cataracts’ of the Nile, where the weight of the boats - compared to the Canadian craft of the Red River expedition - proved to be Wolseley’s undoing. After months of backbreaking effort the river expedition was abandoned without a single whaleboat having made it to Khartoum. 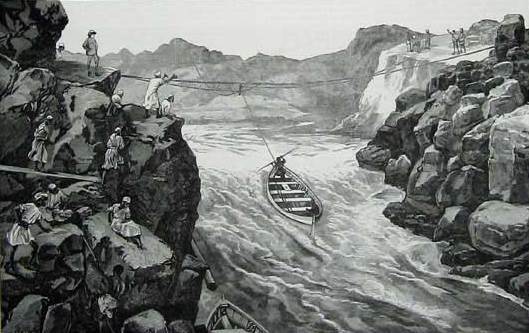 These two images of the Second Cataract shows the huge problems confronting the river column as they tried to haul their whaleboats up against the flow of the Nile. It’s also a scene straight from my novel – from this vantage point Major Mayne watches his Canadian voyageur friend Charrière dive into the rapids to rescue a soldier who has fallen from the rope. Out of sight to the left is the place where Mayne and his fellow officers, and then Jack and Costas in the present-day, make an extraordinary discovery. This image and others like it are particularly precious because the Second Cataract was inundated by the floodwaters of the Aswan Dam in the 1960s, meaning that none of this is visible today. Three photos of the Second Cataract as it appeared before being inundated in the 1960s, the lower one a very rare image possibly of the 1880s. 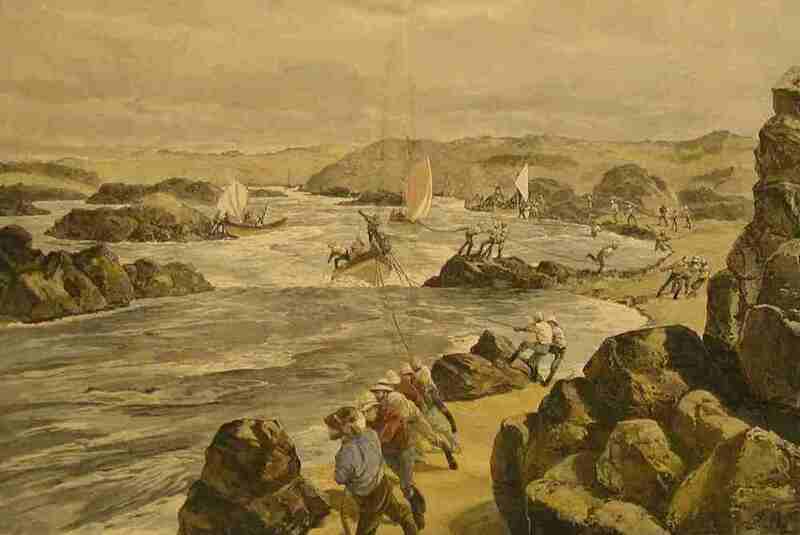 The appearance of the cataracts altered greatly according to whether the Nile was in flood; neither situation was particularly helpful for the expedition, as the river in flood was virtually impassble through the narrow constrictions visible in these pictures, while during the slack period of the year – as the expedition discovered to its cost in the final months of 1884 – the rocky shallows posed an even greater challenge, eventually forcing the expedition to a complete halt. As well as whaleboats the expedition made use of river steamers normally based in Khartoum and therefore already on the upper stretch of the Nile beyond the cataracts. Several of these, specially fortified with metal plates and sandbags and manned by a Royal Naval contingent, waited at a point on the Nile where the river and desert columns were meant to converge and then follow the steamers upstream for the final assault. In the course of the campaign several of the steamers were wrecked, including the Abbas, carrying Gordon’s adjutant Colonel Charles Stewart away from Khartoum along with some of Gordon’s collection of antiquities – a site that has never been explored but that Jack and Costas attempt to discover in my novel. This image shows another wrecked steamer, Gizeh. In the event, two of the steamers, Bordain and Talahawiyya, did make it to Khartoum with a small contingent of soldiers from the desert column aboard, but too late to save Gordon. This etching was based on a sketch by Lieutenant R. De Lisle, Royal Navy. As the river steamers approached the final section of the Nile before Khartoum they came under increasing harassing fire from the Mahdist forces along the shoreline. 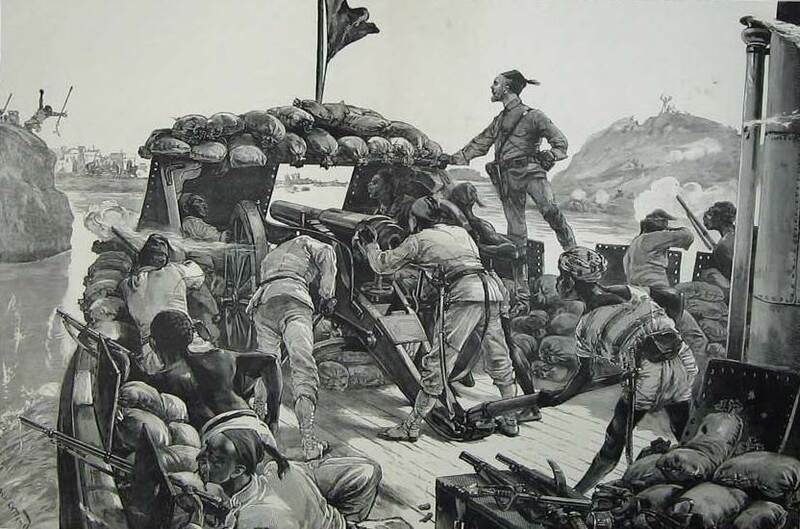 This picture shows in almost photographic detail a nine-pounder gun and its crew in the bows of a steamer, with soldiers crouched alongside with their rifles at the ready. Remington rifles were used by the Egyptian army – the British troops used the superior Martini-Henry – and this picture is of particular interest as a reminder that a large part of the campaign against the Mahdi was fought by Egyptian troops and Sudanese irregulars, with not a single British soldier being visible here. There was no alternative through the worst of the cataracts than to haul up the whaleboats by human labour, as animals or steam traction was impossible. 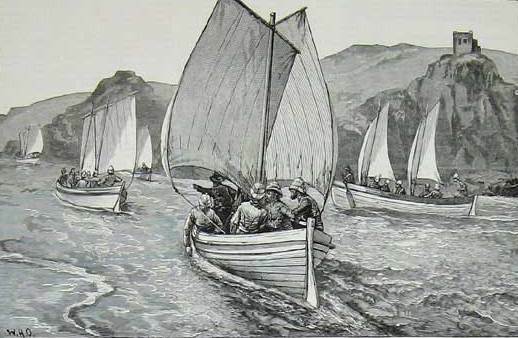 This beautiful picture, cut from The Illustrated London News and hand-coloured, is of special interest for showing a Canadian voyageur in the foreground, one of a contingent of almost four-hundred men - including some forty Iroquoian Mohawks - brought over by General Wolseley because he had been so impressed with their skills as boatmen during his Red River expedition in western Canada fourteen years earlier. Instead of the anonymous officer of several of the other sketches, this one was by Melton Prior, special correspondent for the Illustrated London News during the Nile campaign.